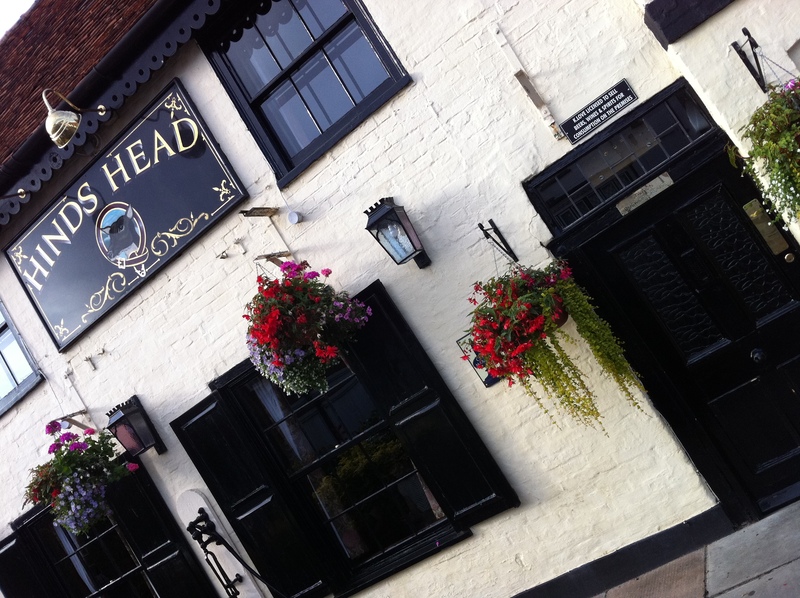 Located in Bray, just over an hour’s drive from London, the Hind’s Head is Heston Blumenthal’s pub/restaurant. It is very charming in its English-ness, with all the period features Kirtsie and Phil would kill for. The entrance is a rather low door that even a person of average height like me (aahhhhmmmm) had to duck (or grouse). Inside, exposed beams and tilting walls added to the character of the place that was apparently built in the 1500s. But enough of that and back to the most important thing: the food. Expectations were high, considering the significance of the HB brand. And disappoint it did not. The starter of thin slices of raw venison with pesto and baby leaf salad was spot-on. I also had a try of the scotch egg with the perfectly runny quail egg yolk in the middle, and the devils on horseback, prunes in armagnac wrapped in ham. 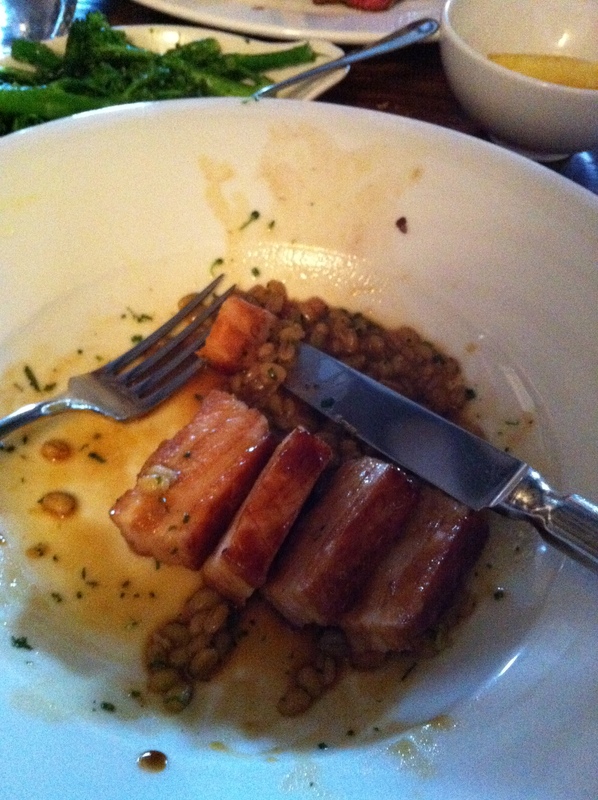 For the main course, I had (drum roll……) pork belly. Yep, predictable I know, but I have to have it everytime it is on the menu. I can only guess, but I think it has been slow cooked for a few hours in a water bath 😉 Tender, melt-in-the-mouth meat served with pearl barley cooked in wheat beer. It looked so good I had eaten half of it before I even thought of taking a photograph of it. Oh, well. Then came dessert, the first peach tart I have ever tasted. A wonderful crust of almond-y deliciousness surrounded the fruit dome. 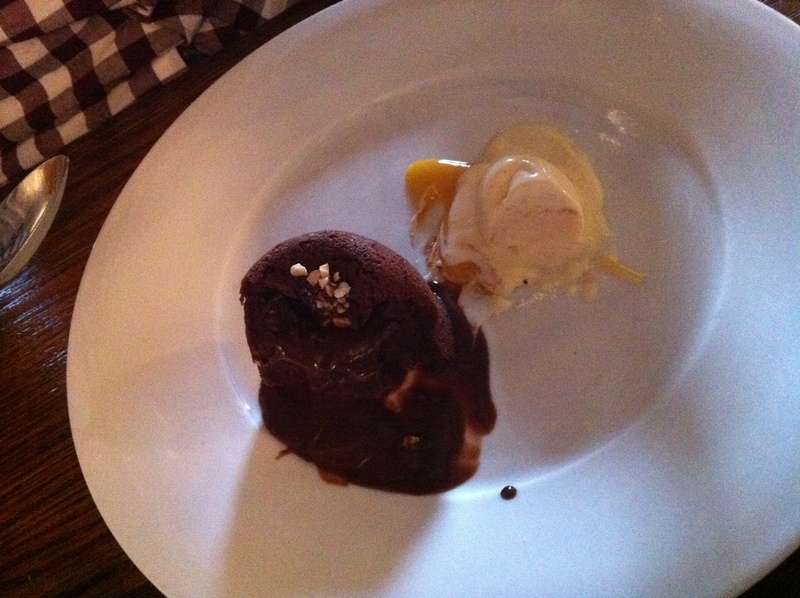 The rosemary caramel underneath the ice cream accompaniment nailed it. And yes, even the cubes of clotted cream fudge that came with the coffee were heavenly. Although the glass of merlot I had wasn’t exactly my favourite, the pinot gris successfully turned it around. Overall, the atmosphere of the pub was warm and welcoming. The service was excellent. And it was, surprisingly, not a wallet-shattering dining experience.